In the 16th century, the Duchy of Cieszyn in Silesia became one of the few Polish-speaking areas where the Lutheran Reformation reached the grassroots, rather than being of interest merely to the nobility or merchants. By mid-century the duchy’s population, including the peasants in remote mountainous areas, was predominantly Lutheran. After the extinction of the local line of Piast dukes (the Piasts had once been Poland’s kings), the duchy came into the hands of the Austrian Habsburgs, who decided forcibly to impose Roman-Catholicism on their Lutheran subjects. As a result, in 1654, the Lutherans lost all of their churches in the Habsburg (Austrian) part of Silesia, Lutheran worship was banned, and, where possible, religious books were confiscated. In spite of the persecution, however, most remained faithful to the Augsburg Confession (this gave rise to the idiomatic expression “tough as the Lutheran faith in the Cieszyn area,” i.e., resilient, difficult to eradicate). 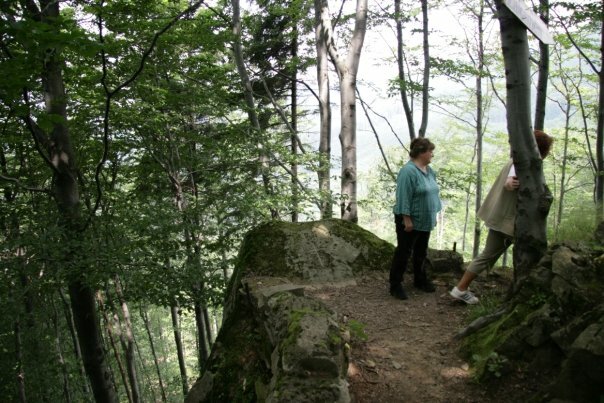 For the following six decades (and in some places as late as 1781) the Lutherans met in secret locations up in the mountains to conduct illegal worship services. Nine such sites are known today. Several are still used for occasional services. "The place whereon thou standest is holy ground." Lutheran services were held at this site in the years 1654-1709. 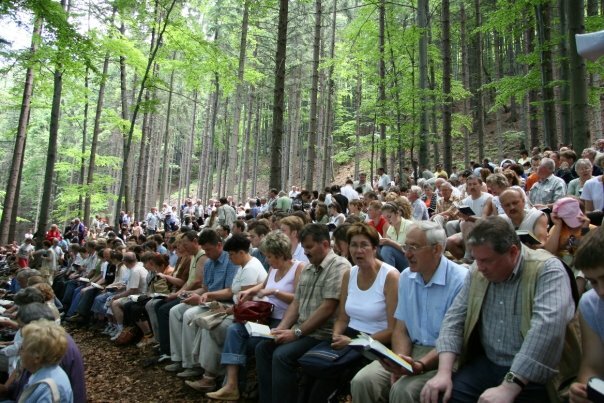 A worship service "at the stone" on Mt. Równica on the feast of Corpus Christi. This annual service is attended by several thousand worshippers. Many hike for an hour and a half to get to the stone. Almost all bring hymnals with them. 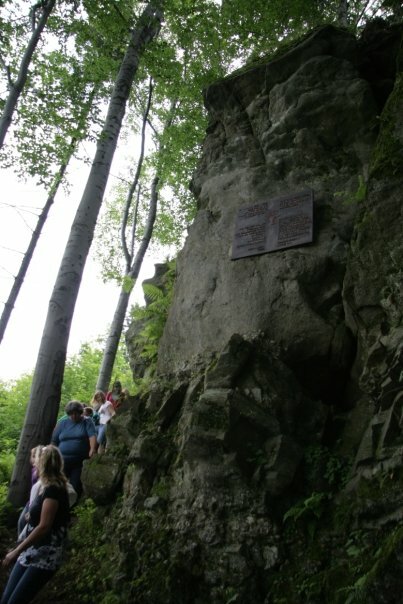 In 1992 a plaque was unveiled at the “mountain church” on what today is the Czech side of Mt. Czantoria (only a few kilometers away from Mt. Równica). 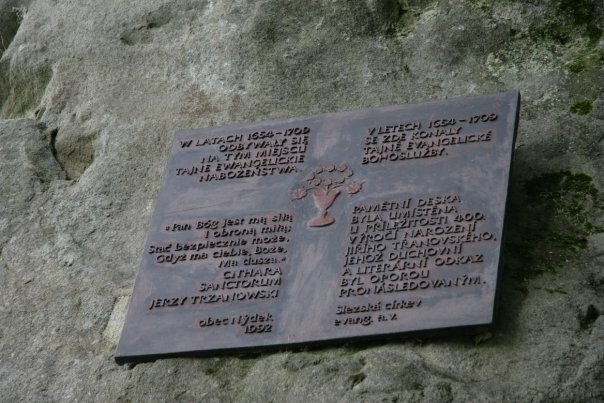 The plaque commemorates the 400th anniversary of the birth of Jiří Třanovský (Polish: Jerzy Trzanowski; 1592-1637), the “Luther of the Slavs.” Třanovský, who was born in Cieszyn, is best known for his Slovak hymnal, the Cithara Sanctorum (Lyre of the Saints), which was first published in 1636 and ran into many subsequent editions. He himself wrote some 150 hymns for this immensely popular hymn collection. My grandmother regularly used our family’s 1818 edition well into the 1990s (she read her Bible and sermons in Polish, but many of her favorite hymns were old Slovak hymns from the Cithara). "The Lord is my strength and my sweet defense..." Jiri Tranovsky, Cithara sanctorum (1636). 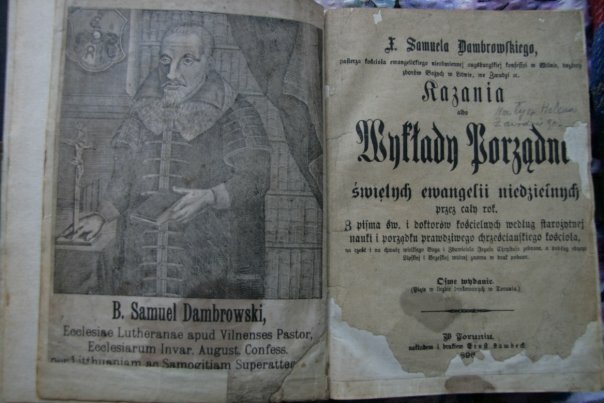 In addition to the Cithara Sanctorum, another book that made it easier for the Lutherans to survive the Counter-Reformation years was a sermon collection by Samuel Dambrowski. 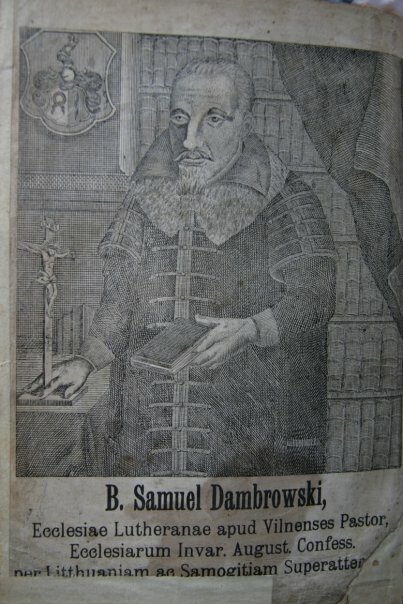 Dambrowski (1577-1625) studied theology and philosophy at the Universities of Wittenberg and Königsberg. Early in his career he served as a pastor in Greater Poland. While there, he engaged in polemic with anti-trinitarians. Driven away by the Counter-Reformation, Dambrowski became a pastor in Vilnius and superintendent of the Lutheran congregations in the Grand Dutchy of Lithuania. He was renowned as both a theologian and a preacher. Dambrowski’s Postil was first published in 1620. Its title page reads: “Sermons, or Expositions of the Holy Gospels [as those are] Orderly [Appointed] for the Sundays throughout the Year. Gathered from Holy Scripture and the Doctors of the Church, according to the ancient teaching and order of the true Christian Church, to the honor and glory of the Mighty God and the Savior Jesus Christ. 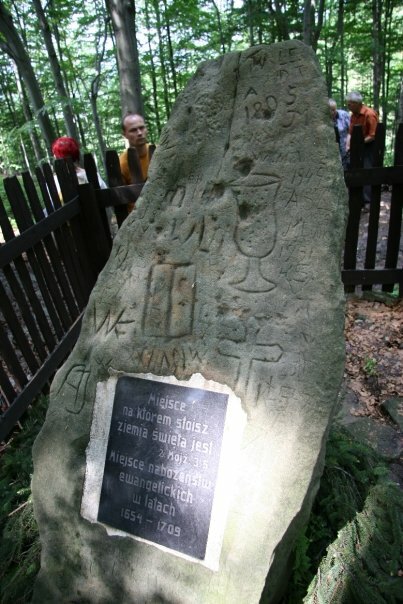 By the Reverend Samuel Dambrowski, shepherd of the Evangelical Church of the Unaltered Augsburg Confession at Vilnius, superintendent of God’s congregations in Lithuania and Samogitia.” The Postil was used by Polish Lutherans for over three centuries, hugely contributing to the preservation not only of Lutheranism in Austrian Silesia but also of the Polish language among the Lutheran populations of East Prussia and Silesia. During the Counter-Reformation in Silesia it was often the only source of regular exposure to Lutheran preaching. Interestingly, because the Lutheran population in the Austrian part of Silesia was Polish and Polish-speaking, this produced a curious reversal of the common stereotype: the Lutherans were Polish, while the German-speaking population was Catholic. This particular edition was purchased by my great-grandparents and at the time, as my grandmother often pointed out, it "cost as much as a cow." 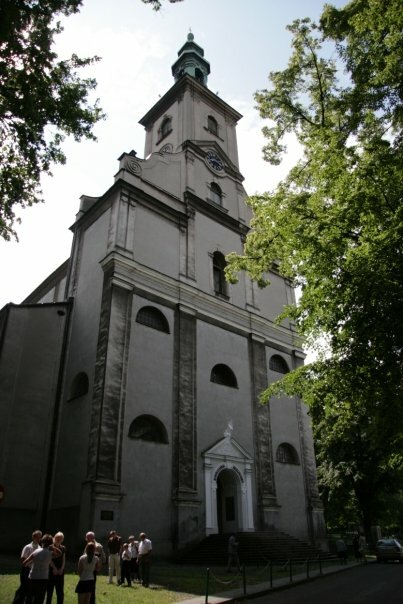 This church was one of the “grace churches” whose erection was provided for by the Treaty of Altranstädt (1707) between Charles XII of Sweden and Emperor Joseph I Habsburg. The treaty brought an end to religious persecution in the Austrian part of Silesia and ushered in a period of moderate toleration. 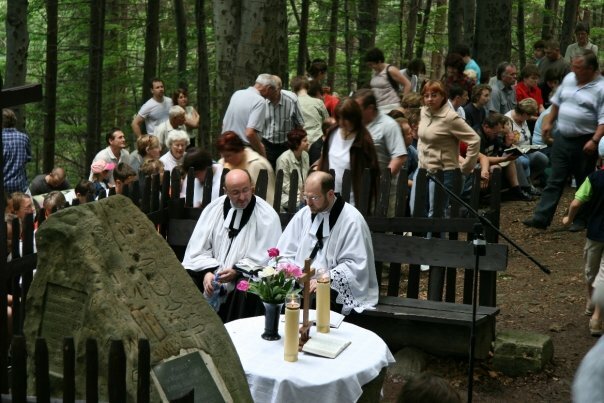 The Lutherans, who for over six decades had been forced to meet in secret “forest churches” in the mountains, were now able to worship in relative freedom and openness, although Roman Catholicism remained the privileged confession for yet another century. Its privileged status manifested itself, for example, in the requirement that Lutheran churches have entrances away from the street; in addition, Lutheran houses of prayer were initially not allowed steeples or bells. 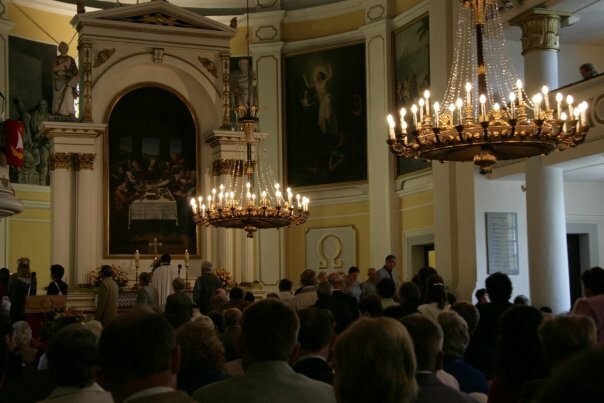 The year 2009 marks the 300th anniversary of the Jesus Church, which already in the early years of its construction became a vital center of Lutheranism in Central Europe. Because of its resilience and its spiritual and intellectual impact, the Lutheran Church in Cieszyn Silesia has been aptly described by one author as the “Mother-Church of many nations” [Oskar Wagner, Mutterkirche vieler Länder. Geschichte der evangelischen Kirche im Herzogtum Teschen 1545-1918/20 (Böhlau, 1978)]. St James the Elder Lutheran Church, Ustroń, Southern Poland. On high festival days the entire congregation processes behind and around the altar, with everyone depositing his or her offering into a tray or a wooden box when coming out. Holy Trinity Lutheran Church, Warsaw. 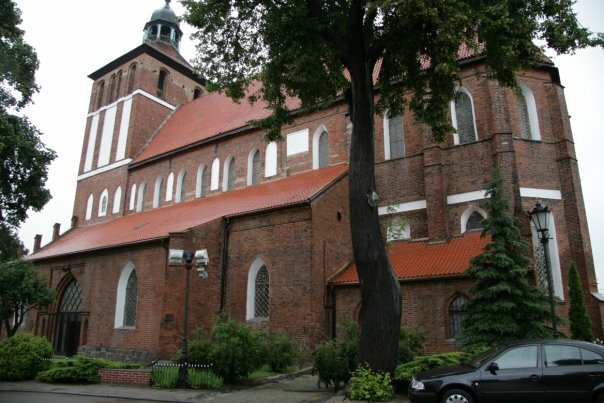 With the Counter-Reformation on the wane, the Warsaw Lutherans received a royal privilege to build a house of worship. 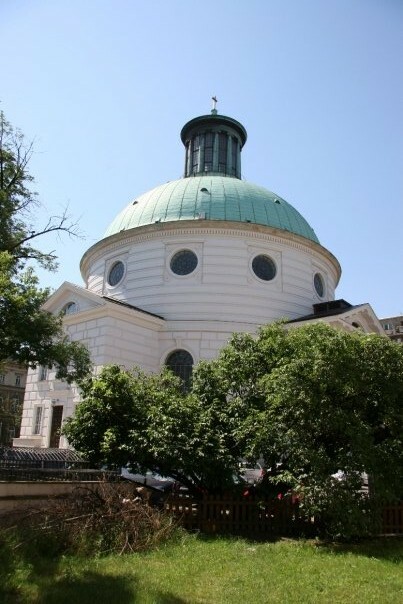 Styled on the Roman Pantheon, the church was built in the years 1777-1782. A former Lutheran church, now Roman-Catholic, in Bartoszyce, northern Poland (formerly Bartenstein, East Prussia). Though there were Polish-(Mazurian dialect)-speaking Lutherans in East Prussia, the political and ethnic situation was obviously much different from that in Silesia. 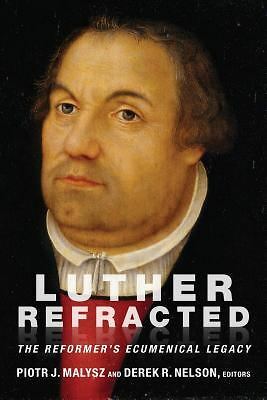 In Prussia Lutheranism was the established religion, and most of the Lutherans were German speakers. Toward the end of, and in the years following, World War II most of the German population fled, was killed, or resettled, while East Prussia was split between the Soviet Union and Poland. The majority of the population today is not indigenous and is predominantly Catholic. 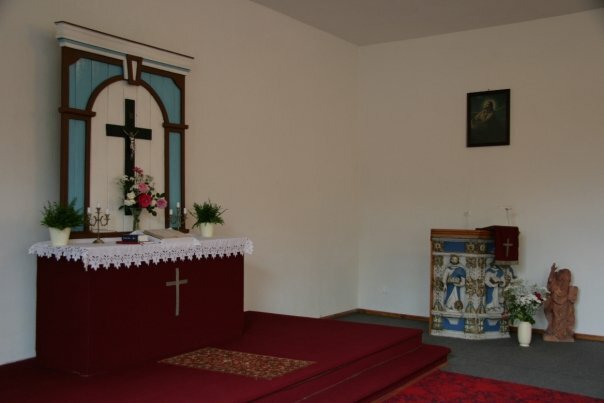 Lutheranism “in diaspora.” This photo shows the interior of the present Lutheran church in Bartoszyce. Unlike the pre-World War II congregation, which was largely German, the congregation today is all Polish and quite small. 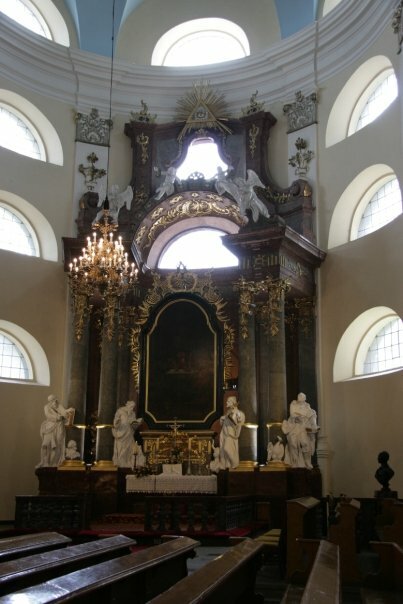 Note the ornate pulpit, which was salvaged from a Lutheran chapel in Barciany. This is probably the first time I’ve heard of *Polish* Lutheranism. If your comment is meant to express your surprise that there are any Lutherans in Poland, then the answer is yes. The church is very small, with only about 80,000 members, half of whom live in Cieszyn Silesia. Several years ago Poland actually had a Lutheran prime minster, Jerzy Buzek, who is currently President of the European Parliament. If you’re wondering if the phrase ‘Polish Lutheranism’ is appropriate, then the answer is also yes, since the church has its own distinctive set of practices. Besides, considering the ever-shifting boarders, it is perhaps more accurate to speak of Polish Lutheranism than of Lutherans in Poland, since, for example, the Principality of Cieszyn, which belonged to a splinter line of the Polish Piast dynasty, became Habsburg property in 1654, and Poland did not exist as an independent state from 1795 till 1918. Thanks for the photos and comments. This is wonderful! I’ll send out the URL so the folks at St. Luke’s can enjoy this! Fascinating! Thanks for posting all this. Looking forward to seeing you again soon. A good job. Thank you. The Lutherans in the Cieszyn area can now be proud of a decent publication in English about a little bit of their history. It so hard for me to wrap my head around the number of Lutherans in Poland; 80,000 about the population of Fitchburg & Leominster combined. Your grandmother sounds amazing! Fascinating post. Those sites in the mountains look like beautiful places for worship. There must be some serious traffic jams on the trails as everybody hikes to get there! Thank you for taking me on this fascinating journey into the history of Lutheranism in Poland. I can’t wait for further updates. One topic I would enjoy your elaboration is the distinction between Lutherism in Poland versus central Europe in the 21st century. Thanks so much for sharing your Polish Lutheran heritage. Thanks for the pics and the info. I know very little about Polish Lutheranism. A young lady in my parish just finished a two year stint as a volunteer at the Lutheran High School in Cieszyn. She very much enjoyed her time there and made many lasting friendship. In fact, she was stricken with a good deal of grief as she returned to the States. Many thanks! Very interesting coverage–especially the book titles. My Proske ancestors were Lutheran Silesians. Interesting, because I am on my mother’s side decendent from Polish Lutheran common people, although probably masurians. Grandmothers maiden name was Ceder, but I have heard that it orginally was something like Cedrowski. In fact, I think that a distant relative to me come third in the Miss Poland contest 2006.